Joerg was born in Hanau, Germany. He received his MFA from the Hochschule für Gestaltung in Offenbach, Germany, in 1994. Additionally, he studied at the École Nationale Supérieure des Arts Décoratifs in Paris, France. Joerg moved to the United States in 1996. Joerg Dressler’s work is driven by nature and how we perceive it. “It is the unpredictability and mysteries of nature that intrigue me,” he says. His evocative, vigorous paintings derive from a sincere dialogue between the representational and the abstract, the conceptual consciousness and pure spontaneity. 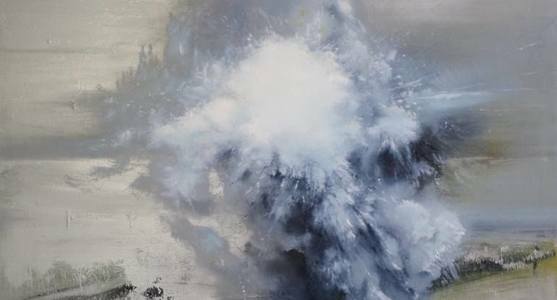 Recurring themes in his work include the passage of time, impermanence, frailty, and perception. He paints solely from memory; as a result, disjointed experiences of the seen and learned are re-assembled, creating a reality of their own. 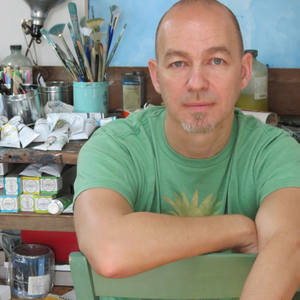 “Joerg evokes sublime depictions of our confrontation with nature, especially the contrary effects of nature on the human psyche,” writes Christopher Busa in the current issue of Provincetown Arts. “He places tranquility side by side with violence, light clashing with the dark, fragility beside boldness—surprising forces seemingly summoned on a whim, with involuntary energy.” Dressler is a recipient of the Romanos Rizk Scholarship, and his work is included in the permanent collections of the Provincetown Art Association and Museum and the Leslie-Lohman Museum of Gay and Lesbian Art in New York.